First of all these eyelashes are very durable and will not come apart easily or fall out like some lashes I've tried , fantastic quality. They have a strong strip holding them together which allow you to wear them an indefinite amount of times with proper care. 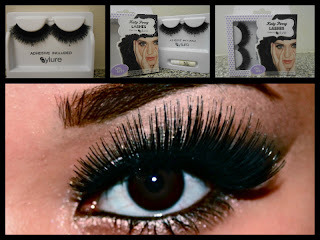 Like other false eyelashes you should make sure they fit your eye shape and cut off the excess. With good care I've worn my Katy Perry Eyelashes 5 times. They're beautiful and were very easy to put on. these go on fabulously and stay on for as long as you need them too! The directions are straight forward and easy to follow so I had no problem applying them. Definitely recommend! This Lashes give the deffently OH MY look, they have a layered/double effectthey appear bigger when you get them of the packet. These are definitely not for people who don't like to stand out. They make my eyes look wider and brighter! I'm in love with them and they look so lovely on but they are really lightweight not heavy at all. *Quick and Easy to use. *The lashes are very dense. *Both eyelashes will make for sure your eyes shine. *After applying the glue to the lash, leave until sticky. If you do, the lashes will stick properly the first time. 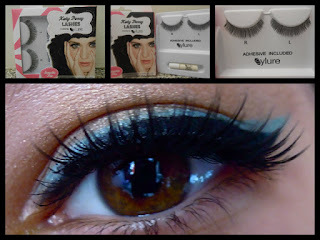 I find it best to leave the lashes for about 20-30 seconds after applying the glue. *When applying the lashes, get them as close to the lash line as you can. If there is still a small gap don't worry, you can use a soft eyeliner to simply fill in the space. *A great idea is to use a cotton swab/bud or tip to just lift the lashes up (after the glue is dry), this will ensure the lashes are level. oh my!! ;) ive been debating or...rather contemplating if i want the Oh My pair...and ive come to a conclusion. i do in fact want them﻿ immensely! !